Orangy Red Fire Opal and Diamond Gold Ring - Sold Out! Complimentary shipping & appraisals from IGYSL Fine Jewelry. Take advantage of our promotional & wholesale pricing. No hassle 30 day return. 'Jalisco Fire Opal (1.01ct, Oval) & surrounded on each side by another oval cut ~.58ctw of additional red fire opals. And, we're not done yet. You also yet .05cts of VS clarity of F color of natural white diamonds. All of this set in 14K White Gold. This is a Designer ring, part of our IGYSL Collection. Beautiful three stone style ring with crystal white diamond accents set in solid 14K stylish white gold. Total Gem Weight 1.71ctw, with Comfort Fit Back. Designers are intrigued with of color ghost of years past, but are spicing things with spirit of the present of the here and now. You'll see a definite influence of the retro era and a touch of exotic imaginary characterized in the these bold colors for this season: purple, neon orange, royal blue, aluminum, aurora red, misted yellow, sangria, mauve mist, cognac, bright cobalt & cypress. It's a lovely, fashion forward gold ring for less than $250 as part as our promotional pricing for select items. Don't miss this beauty, it will not last! Simply STUNNING! Designer quality w/o the design house $! Simply STUNNING! Beautiful color, internal glow! IGYSL is WONDERFUL! Watta DEAL! 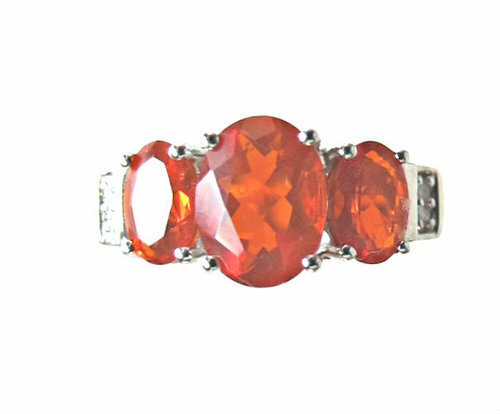 Click the button below to add the Orangy Red Fire Opal Ring to your wish list.